If you don’t know who Tom Rudolph is and you consider yourself a Music Technology Savvy kind of person… you’re missing a big part of your education! Dr. Rudolph is one of the top leaders in of Music Technology Education Integration and a widely published (prolific) Music Technology author. He is one of the founding members of TI:ME and his list of accomplishments in Music Education Technology is unparalleled. 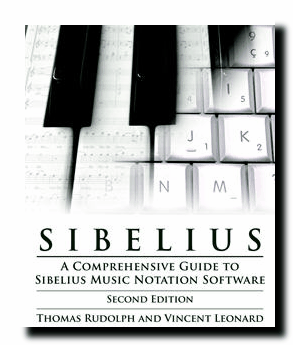 If you are a user of Sibelius, this is a must-have book for your collection – it just might be the only book you need! His latest book edition about Sibelius is a must-have for anyone using Sibelius personally or teaching with it in the classrooms. Tom’s new book, Sibelius: A comprehensive guide -2nd Edition, covers just about everything new in Sibelius 5 and 6 and was go-authored with Vince Leonard (Composer and Copyist). This book is a must have at the street price of $29.95. In addition, the book has a great companion Website with excellent information and usable files (including the completed work-files for each chapter!). You can also purchase this direct from companies like SoundTree. Let me know if you are using this or have read the book in the comment section below; I would love to hear about your success with it!